Join Lucia and Hannah this week as they interview two people who experience chronic pain–and how that impacts their lives on a daily, weekly and life-long basis. Lucia also adds her own reflects in experiencing chronic pain. 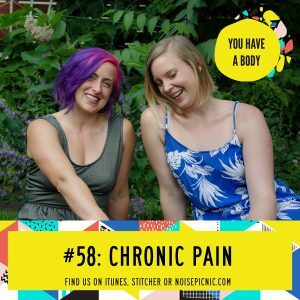 Hannah describes how to understand chronic pain from the perspective of a gym coach… what to look for in a coach, and how athletic coaches can support their clients’ bodies while navigating what is chronic pain, what is acute, and how to integrate a new workout routine navigating all of this! Like what you’re hearing? Great! Leave us a review in iTunes and we’ll send a personal shout out on an upcoming episode to you!